$219.99 & FREE Shipping on orders over $59. A Stainless Steel pump housing is food-grade and nearly indestructable. Exact same internal pump as our H315 but with a stainless steel housing. Stainless steel is the material of choice for professional breweries because it is a durable, food-grade metal that can withstand caustic chemicals and can also be effectively sanitized. 3/4" mpt on center inlet. 1/2" mpt outlet. The magnetic drive acts as a clutch allowing the user to put back-pressure on the pump to slow down flow. With a ball valve on the outflow, you can slow flow all the way to nothing. Since it is a magnetic drive, it is not self priming, you must put the pump under the level of the liquid source. We wanted the pump to be brewer friendly so we had March install a bracket so that it can be mounted. We also had a 6' power cord with plug wired in for easy use. 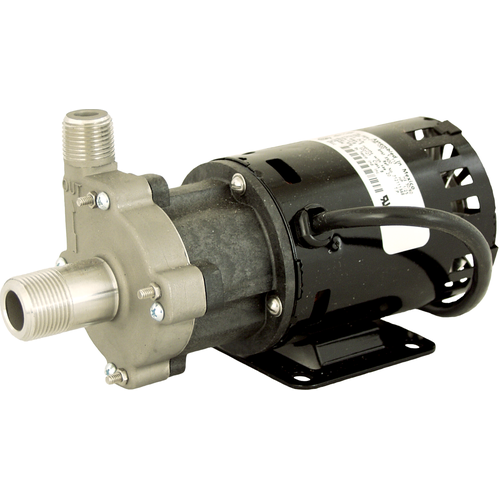 This is a tough little pump with a 1/25 hp, continuous-duty 1.4 Amp motor which can be run non-stop for extended periods. This pump has a maximum flow of 7.2 GPM with a maximum head of 12 feet. For an example of typical usage: with a head of 6' it will pump 3.25 GPM and with an 8' head it will pump 2.5 GPM. Motor requires 115v 50/60HZ power requirements. What is the actual March model number for this pump? I've been using two of these pumps on my electric HERMS setup since 2009 and have had zero priming, flow, or heat retention issues and would buy them again in a heartbeat. I own two. Their super durable, easy to maintain and clean.